To quote Leonard Turnevicius of the Spectator, “Some people are born with a silver spoon in their mouth. Laurence Kayaleh was born with a violin in her hand.” She is the daughter of noted violin pedagogue Habib Kayaleh, who has been running the Kayaleh Violin Academy near Geneva, Switzerland since 1989, and who, according to Laurence, “taught her everything.” Not a little “something” was added, though by masterclasses with Nathan Milstein, Yehudi Menuhin, and Igor Oistrakh. In 1999, arriving for the first time in Canada for an appearance with the Montréal Symphony Orchestra under its then conductor Charles Dutoit, Kayaleh fell in love with the Old World charm of the city and decided to make it her home. A Canadian citizen for nine years now, Kayaleh has been on the Montréal University’s faculty for the past eight years. Before that, Kayaleh took First Prize at the Swiss Competition for Young Soloists and Grand Prize at the Stresa International Competition in Italy. Solo appearances with orchestras in Paris, Prague, Moscow, Basel, Bern, Zurich, Geneva, Toronto, and the U.S. have earned her critical praise and an international reputation. For the past 23 years, Kayaleh has performed on a 1742 violin by Pietro Guarneri (aka Petrus Guarnerius) (1695–1762), older brother of the more famous Guarneri family violin maker, Joseph Guarnerius del Gesù (1698–1744). 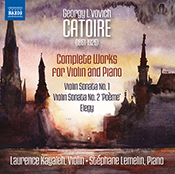 Laurence, I’d like to talk to you mainly about your recent recording of the complete works for violin and piano by Russian composer Georgy L’vovich Catoire. I understand that you’ve also recorded the complete violin and piano works by Nikolai Medtner. So first, tell me what got you interested in this generally neglected area of the repertoire and what led you specifically to the fairly obscure Catoire. Since the early stages of my artistic life, I was eager to learn new repertoire. Of course, there is always endless beauty to discover in music, even in the regularly performed repertoire. The musical literature is incredibly rich, inspired, and inspiring. Every time I work on a Brahms or Beethoven sonata, or any work of the standard repertoire, I approach it as if it were the first time I read it, even if I have already performed it many times in concert. Music grows, as we grow as human beings. The general conception of interpretation, and the understanding of composers’ indications become much deeper with time and experience. A genuine artist never knows a work completely, even after years of dedication. The artistic evolution is constant; it never ends. This is also the beauty of the Arts. The repertoire written for the violin is vast (although not as vast as the piano’s! ), and some lesser-known composers wrote extraordinary works. These composers were underappreciated for various reasons: unfortunate timing, less prolific repertoire, or unconventional musical style. For instance, Nikolai Medtner’s music was still very Romantic, when new-Romanticism, Modernism, and atonalism were already deeply rooted. Even though I regularly perform and cover well-known repertoire ranging from the Baroque through the contemporary eras, I believe it is also my role, as a performer, to present works by less known but very inspired composers to a larger audience. There are some remarkable jewels out there yet to be explored—a real gold mine. When I first discovered Georgy Catoire’s violin and piano sonatas in one of the very rare recordings available with David Oistrakh and Alexander Goldenweiser, this music immediately caught my attention. Catoire’s music is still very rarely performed or recorded. I decided to record his complete works for violin and piano as a continuity of Medtner’s complete works for these instruments which I recorded for Naxos a few years ago. Catoire dedicated his First Sonata, op. 15, to Medtner. In the Second Sonata, op. 20, “Poème,” Catoire’s musical writing demonstrates great inspiration and maturity. The work is written in one movement. I am very grateful to be able to present these gorgeous works to music lovers through this recording, which means a lot to me. 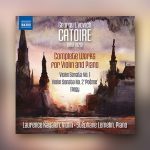 If one heard these violin and piano works by Catoire without knowing anything about the composer and his background, one would almost certainly guess the music to be of the French Impressionist persuasion. Yet we know that Catoire was Russian. So where does the French influence come from? Georgy L’vovich Catoire was indeed a Russian composer, but he was of French descent. This certainly had an important impact on his music. He was born into a rich family of traders, the “Catoire de Bioncourt,” from Lorraine, in France. The Catoire family arrived in Russia at the beginning of the 19th century. Catoire’s music was influenced by Scriabin, Tchaikovsky, Wagner, Franck, Chopin, and even Debussy. The uniqueness of Catoire’s music resides in the luminous conjunction of his French heritage (intangible pastel colors in the harmonies), the great Russian legacy, the German influence resulting from his studies under Karl Klindworth in Berlin (hence his great admiration for Wagner), and his noteworthy training in mathematics at the Moscow University, where he graduated with high distinction. However, the mathematical complexity of his writing, which results from his singular concept of rhythmic patterns, gives birth to musical phrases governed by a feeling of perfect continuity in which the beat serves the musical pulse without hindering its flexibility. The musical structure of his music is sound and vigorous, with poignant melodies and harmonies. Catoire was a prominent theorist, and he wrote The Theoretical Course of Harmony and Musical Form. It was very moving to see how enthusiastic audiences welcomed Catoire’s music after our performances. Despite its sophistication, this music remains very natural, fascinating, and full of passion, depth, and rich color. In following the score to Catoire’s B-Minor First Sonata online, I was particularly struck by the rhythmic and harmonic complexity of the thing and the technical difficulties—the frequent meter changes, the extreme chromaticism, and bars that didn’t seem to add up in number of beats to their time signatures. On first encountering the piece, were you as surprised as I was by Catoire’s musical convolutions and conundrums? Oh yes, I was, and the surprise became even stronger when I started working on the Sonata No. 2. What a great challenge! During the first rehearsal, putting the parts together constituted a real rhythmic puzzle. The ensemble needed time to reach the necessary polyphonic coherence, involving the multifold melodies and dialogues between the left and the right hands on the piano and the violin part. The pianist’s left hand is almost like a third instrument, playing at the low end of the keyboard (especially in the Second Sonata), and creating an often dark atmosphere that imitates the cello section of an orchestra. An example of the rhythmic complexity is that the violin often starts a phrase one 16th note after the piano; the reverse situation is also frequent. The general flow of the phrases is gorgeous, as the writing always avoids the feeling of a rigid or a static beat. It might be again his brilliant mathematical mind speaking. This is very complex for the ensemble, and requires enormous precision from both musicians. What were some of the more difficult technical challenges you faced in preparing these works for performance, not just in mastering the written notes but in coordinating and integrating the violin part with the equally demanding piano part so ably performed by your accompanying partner, Stéphane Lemelin? One difficulty was our concern about the text and the rhythmic balance of the ensemble. The role of a performer is quite subtle. One must follow and respect the musical text and the composer’s indications, while in a way “reimagining” the piece using the eloquent and precise indications given by the composer. There is a distinct but fragile line between what the performer can do or not to serve the composer’s intentions without it being detrimental to the personal interpretation. The other concern was related to the general ambiance of the music. We needed to emphasize the coherence in the sound colors to create a total “communion” between the instruments, thus favoring the general atmosphere, respecting the color of the harmonic architecture, and facing with serenity the abrupt mood changes, frequent in Catoire’s music. This is always a very critical step in chamber music, made even more complex by the uniqueness of every musician. This is why it is rare to find the right musical partner for such a huge endeavor, a problem I did not encounter with Stéphane, with whom things were easy and flowing. It was quite exciting to work with him on this recording project. Technical mastery is one thing, but penetrating Catoire’s unconventional musical mind is something else. In certain ways, his music reminds me of another near Russian contemporary, Aleksandr Scriabin. On first encountering Catoire’s violin works, did you find the music an interpretive challenge intellectually and emotionally, or did it come to you naturally and easily? Upon my first reading of Catoire’s works for violin and piano, I fell immediately in love with this tremendous music of divine inspiration. It was indeed a huge artistic challenge for the reasons mentioned above, but the music came very naturally to me. Catoire was very self-critical and entirely devoted to his art. Music was to him the most important mission of his life. His works were the best expression of the depth of his soul. As you know, I previously recorded Medtner’s complete works for violin and piano. This music is the fruit of genius! I have a very special affinity for and a tight link to Medtner’s music, and I am sure that this experience helped me considerably to understand Catoire’s sumptuous music. I’ve read that Tchaikovsky and Arensky were major influences on Catoire, and that Catoire could be seen as the once missing, now found, link between them and Rachmaninoff. There were quite a few Russian composers around the same time as Catoire—Sergei Taneyev, Sergei Lyapunov, Alexander Glazunov, Vasily Kalinnikov, and the above-mentioned Scriabin, to cite some of the better-known names—who might just as easily fill the “missing link” bill. What special entitlement does Catoire have to that designation? Or do you disagree with it? I would certainly add Nikolai Medtner to the list, although he passed away in 1951, and maybe even Nikolai Myaskovsky, who deeply admired Catoire’s genius. Medtner knew Catoire closely from the age of 12. They had a strong mutual respect. Medtner described Catoire as a rare man and genuine artist, one of the kind of which there are only a few. Catoire and Medtner both considered modern music and dodecaphonism as an affront to the harmonic tradition they were already in accordance with. Catoire was particularly innovative with musical rhythms. He certainly developed a new and unique way to approach a huge variety of rhythms, but he used this wonderful tool to serve his deep musical inspiration and very diversified themes. It added a completely new dimension to the music, reinforcing the moods of each phrase. Even in a slow tempo indication, he could express an agitated character throughout his mastery of musical syncopation techniques, and his own highly developed musical language and pronounced individuality. Tell me about your teaching duties and experience at the University of Montréal. Does Canada as a whole or the province of Québec foster music education programs at the lower grades so that by the time students come to you they’re relatively well grounded in our Western musical heritage? The Canadian natural potential for the arts is in general very fertile. However, despite the presence of good music teachers in the pre-university music programs, there is still a lot to be done to help young string players build up a more solid cultural and instrumental education before entering university. This shortcoming becomes a major hindrance, namely when one adds to it the demanding requirements of the university system’s general yearly curriculum. It is a privilege to support the development of young musicians and future artists. The pedagogical role is a crucial responsibility, considering the critical situation of today’s culture in general and classical music in particular. Having recorded Catoire’s complete works for violin and piano, as a violinist you’re now done with him. In addition to the aforementioned complete violin and piano works by Medtner, you’ve also recorded the complete violin sonatas by Honegger, and you’ve made a number of “live” recordings that can be streamed on your web site (laurencekayaleh.com), including of Dvořák’s Violin Concerto with Canada’s Kingston Symphony, a program of late 19th-century French chamber works, sonatas by Ravel and Kodály, and works by Henry Cowell and John Corigliano. What are your next projects? Is there another surprise, like Catoire, in the works? Definitely! There are many interesting projects ahead. It is still early to talk about it at this point. In the meantime, I’ll be performing a French program in Montréal, Canada, also with Stéphane Lemelin, including Maurice Ravel’s Sonate Posthume, César Franck’s sonata and Gabriel Fauré’s prodigious Sonata No. 2, op. 108, which is less often performed than his Sonata No. 1, in A Major, and among other chamber music concerts, Arensky’s superb String Quartet No. 2 in A Minor, op. 35, during the spring of 2017. By the way, Anton Arensky and Georgy Catoire were very close friends. I am looking forward to these events.